While I gain tons of Google indented listings for money terms, and I can achieve them quite often in minutes, rather than days, they are almost always achieved using a few simple steps. The second method I use for topics is tags that get frequent mentions. I have at least partially recovered my search ranking since yesterday for Players With Money, and achieved a double listing, though how effective depends on which data centre you look at, and geographic location. 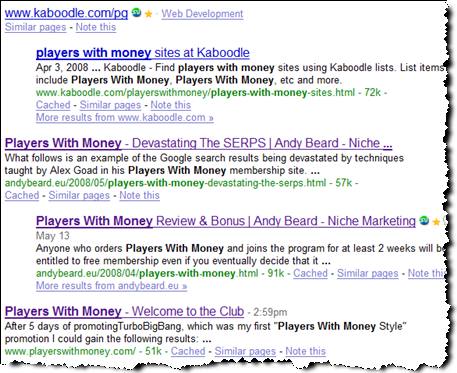 Players With Money is being promoted to a number of very large email lists currently, and this is bringing me search traffic – as I wrote yesterday, it is a great service, and worth checking out. 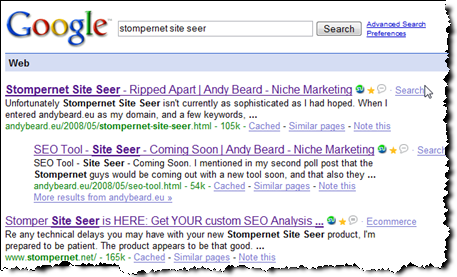 I also have a double indented listing for Stompernet Site Seer – but I am not ranking anywhere near as well for Stomper Site Seer – I have tweaked the page, and also added a tag page for that specific search term. A search just on Site Seer does, however, bring the results I hoped for. Another money terms I rank comfortably for is Social Power Linking. This new link will probably help the page which mentions the new price rank in the top spot and add a little more longevity. Jack has to settle for the 3rd and 4th place for his own product, but I am sure he doesn’t mind. I really should get one for Blogrush and knock Tamar down a couple of spots. Since I wrote about the free traffic from Blogrush that Alex received, I had actually had one day when Blogrush combined with Traffic Jam was my highest referrer. It is not server breaking traffic, but it is targeted, and 100+ targeted visitors are not to be sneezed at. You would think I would actually have one for PayPerPost by now. 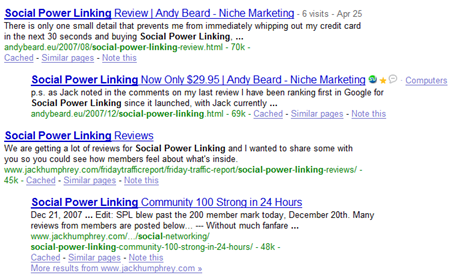 I do have a first page ranking with a tag page, but my most linked to post used “Pay Per Post” in both the headline and title tag – that was easily fixed, and with the additional link I will probably give that post a boost up the SERPs to go knocking on the door of both Wikipedia and Techcrunch. Techcrunch with their “Crunchbase” in many ways kill their search engine traffic, especially with the way they frequently don’t interlink between posts with keywords. Linking to yourself with keywords is just as important as to other people. You would think that with all the times they have written about PayPerPost they would have a double listing… they don’t. CrunchBase is slowly rising up the SERPs but are 2 listings on different domains really a good alternative to a double listing? Ok, so it is not that old, it is from the launch of Stompernet Smarts. Who do you think ranks first for Stompernet Smarts? I do. Now if Michael Arrington were a member of Stompernet, he or his web developers would know how to get double listings at the top of the search engines. Currently, his team have managed to get a single listing on Facebook… with CrunchBase… just below a 2-year-old post from Mashable. A similar query for Myspace and both are out of the Top 30. Let’s be a little more topical, the current Microsoft Yahoo deal – all they would probably have to do to have a double listing for a search term like “Microsoft Yahoo”, without quotes would be to do a little interlinking between these 2 posts. Fresh search engine results aren’t just a job for Google to handle, site owners who know what they are doing can heavily influence them too. There are plugins which can probably do enough interlinking to make a difference, and keep the search listings current, and help these top blogs remain to look fresh in the SERPs, or it can be done manually. 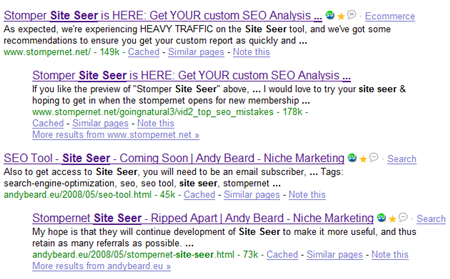 Linking purely off-site to Crunchbase, and then back to newer posts isn’t going to achieve double listings. Now Techcrunch is doing very well for itself, at the start of the year they were hovering around 600,000 subscribers, and now they are 940k+ – I am sure a huge amount of that is related to the Microsoft / Yahoo deal, and possibly Facebook. Could they be over 1,000,000 if they had their search results current? If you look at Google trends data, the number of people searching for “Microsoft Yahoo” without quotes over the last few months has been very similar, and in some cases more than the people searching for stock quotes with MSFT or YHOO in Google. For a blog looking to sell advertising, that is an awful lot of potential subscribers left on the table, probably reading their Microsoft Yahoo news… somewhere else. This is the kind of stuff the guys at Stompernet teach for free, you should see some case studies. Stompernet will be reopening their doors tomorrow, and it is unlikely I will be mentioning them again. They provide great material for free, but ultimately often it seems like I am beating a dead horse. I certainly didn’t come close to winning that MacBook Air at the weekend, though I expected as much… in fact over the course of this week, I haven’t managed to encourage enough people to sign up for the various locked FREE resources to win… even a digital picture frame. What ultimately is the value of building an authority blog, and dominating search results, if you don’t at the same time leverage your traffic into a responsive email list? Yesterday Andy Jenkins released a sneak peek inside Stompernet. Now if you haven’t already, make sure you have downloaded all the free videos to your Hard Drive – they are available for download in the right-hand navigation. You never know when you might want to refer to them again – I have lots of Stomper videos recorded on DVD as well. Also, make sure you have signed up for the 100% Free Stomper Site Seer – I know for many the first version might seem a bit basic, but the guys working on it really know their stuff, and I expect it to be immense value in the future.